There’s a great tutorial about dissolve over here. You can read it before moving forward. It calculates opacity mask based on texture and dissolveammount scalar value. 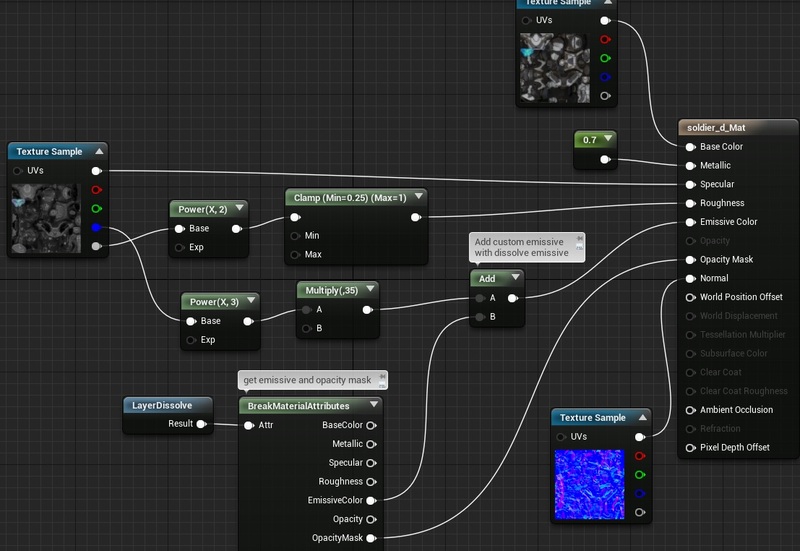 Next it’s adding emissive depending on EmissilveBlendSize value. Make sure DissolveAmmount is set to 0 by default! 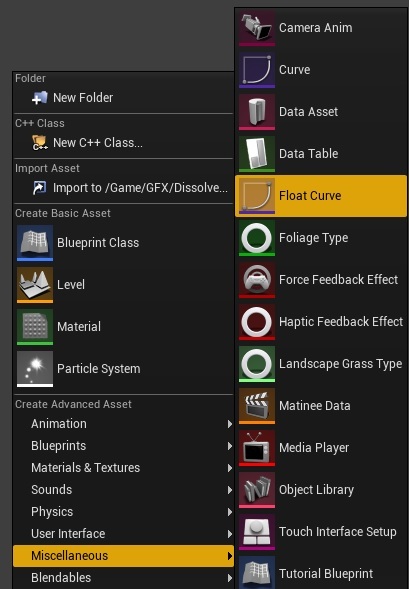 After creating material function it need to be added to every enemy that you want to see dissolve effect. 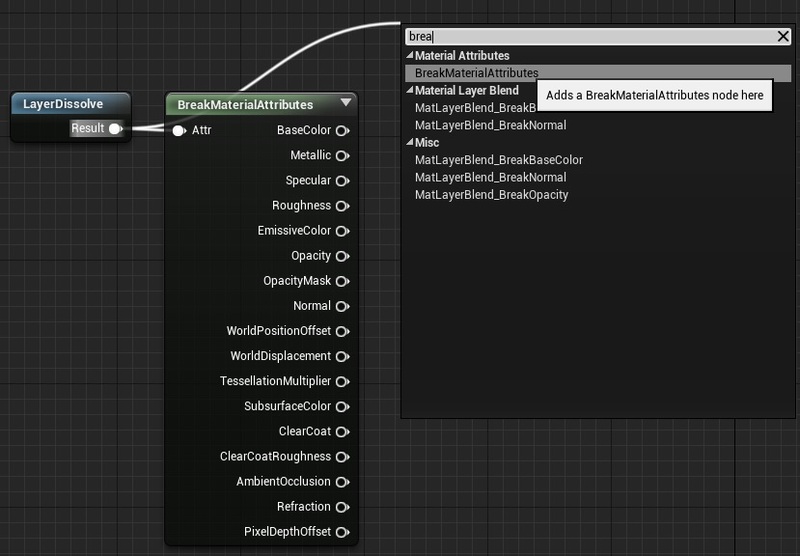 Find MaterialFunctionCall node, and then select LayerDissolve in Details panel. So we can get Emissive and Opacity Mask from it. Make sure material blend mode is Masked. It need to have Opacity Mask attribute. Now just add Soldier custom emissive to dissolve emissive and do the same with opacity. And that’s it. You have final material that can support dissolve. The same thing need to be done to every enemy material that you are using. Now we can actually run the dissolve. You will mess with the values here later – when you will see dissolve effect running. DissolveMaterials Material Instance Dynamic Array This will store all materials that should be updated by dissolve. isDoingDissolve bool Is updating dissolve. CurrentDissolveAmmount float Holds current dissolve ammount. Curve Float Curve Reference Should point to early created DissolveCurve. AccumulatedTime float Holds accumulated time. It will be used to stop dissolve when it gets proper value. DissolveColor Linear Color Should be Editable. This will be passed to Material to change the color. Now open your event graph and add new custom events. It basically iterate all static meshes then getting all materials and change them to Dynamic Material which can use parameters. (our Dissolve function have parameters that we want to change) Normal materials can’t use parameters that’s why you need to create Dynamic Material. This event is exactly the same as previous but it use Skeletal Mesh Components instead. This basically change DissolveColor parameter on each dynamic material. I’m using Begin Play to populate DissolveMaterials and change the color, as I want to do this only one time on loading. This event basically resets everything so dissolve can be fired again. Tick is updating DissolveAmmount on each material. It won’t be fired if isDoingDissolve is false. Now it’s time to use DissolveComponent and find a place to enable and disable dissolve. It will start dissolve effect when enemy will die. Now the best place to reset dissolve will be in Event Reset Enemy interface event.